Speaking of cartoons, I bet Beetlejuice puts the books in his house on a Jordi Mila Wisdom Tree. If Beetlejuice even has books. Maybe he shelves his crawly bugs here instead. Many people use the Tree Bookcase in children’s rooms. I think a ‘forest’ of multiple Tree Bookcases on a wall in a family, game, or play room would be a great way to add functional fun to the room. I give a big hat tip to this DIYer for building her own Dr. Seuss Bookshelf for her nephew’s nursery after seeing a similar bookcase in a store. What a lucky baby! 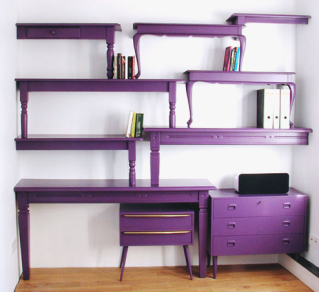 Designer Isabel Quiroga created this bookshelf from old end tables. The original Website featuring Isabel Quiroga is in Dutchbut it shouldn't be too hard to figure out how to do something like it yourself. The Mad Hatter’s bookcase? Actually it is another creation from WoodCurve. How cute would their Handmade Stacked Teacups bookcase look in a coffee shop or kitchen? The Oblique Tower comes in different colors but I like the yellow. It reminds me of honeycomb.